Cruise Planners executives at the inaugural Luxury Travel Forum. 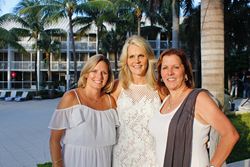 Cruise Planners, the nation’s largest network of home-based travel professionals, recently hosted the inaugural Luxury Travel Forum in Fort Lauderdale, Fla. The luxury- dedicated event is in reaction to an increase in travelers booking luxury vacations through travel advisors. Luxury Sales on the Rise: While the DIY traveler and last-minute penny pinchers are still out there, there - has been an increase in luxury travel sales. In fact, sales for luxury travel is up 35 percent in 2017 compared to the entire year in 2016 within the Cruise Planners network resulting in higher commissions for travel professionals. Best Practices from Top Producers: A consistent trend throughout the event was to get involved in the luxury community, invest in yourself, experience luxury brands first-hand, and offer personalized service. Overall there is a business opportunity for travel professionals to service clients and be the travel expert for these higher end clients, and the market demands a genuine and customized approach. Cruise Planners New Luxury E-newsletter: Cruise Planners launched a luxury specific e-newsletter designed to speak to higher-end travelers by focusing on destinations and travel brand value instead of pricing. This new tactic has generated hundreds of new luxury vacations in the short time it has been deployed. Insightful Demographic Data: Cruise Planners travel professionals now have new big data technology allowing them to track insightful demographic information about their clients. This has propelled additional luxury bookings since the data arms agents with more targeted information to help close high-end sales. Many attending shared how the CP Insights program has made them more successful when targeting clients in the short time since the program launched. Strategic Partnerships with Luxury Travel Brands: Attendees were able to network with preferred partners with luxury offerings through one-on-one meetings, a robust trade show and interactive panels and presentations. Confidence to Close the Sale: Echoed through the conference were tips on closing a luxury client including “do not sell with your own wallet” and “don’t be afraid to ask for the sale.” Some agents are reluctant to ask for a big sale and this forum empowered them with the tools and knowledge they need to be successful in the luxury travel market. Keynote speaker, Frank J. Del Rio, President and CEO of Norwegian Cruise Line Holdings Ltd. encouraged travel professionals to book higher-end travel because of the dividends. "You can sell one luxury cruise and make the same commission as you would selling ten mass market cruises at ten times the work." He also stressed the perceived value with luxury travel that the travel professional can uncover – especially with more inclusive amenities based on what each guest deems to be luxurious. Edie Rodriguez, President and CEO of Crystal Cruises, also presented, sharing her vision with attendees regarding all things Crystal and the growth of the luxury segment by land, water and even air with the launch of Crystal AirCruises’ first luxury private charter jet, Crystal Syke. Other luxury partner presentations included Regent Seven Seas Cruises, Oceania Cruises, Seabourn, Abercrombie & Kent, Micato Safaris, Tauck, Viking Cruises, Scenic Luxury Cruises & Tours and Marriott International Luxury Brands. Cruise Planners is continuing to develop more upscale training opportunities for travel professionals in order to drive more high-end sales.